All hail the humble breadstick on National Breadstick Day, an annual event on the last Friday in October. This year’s celebration occurs on October 25. Breadsticks are slender sticks of baked crispy dry goodness invented in Italy. Aside from their crunch, the best thing about breadsticks is they can be eaten as an appetizer or you can dress them up with all manner of culinary embellishments. Yum! Following a corporate merger with Olive Garden, Starboard Value shocked the business world by eliminating the famous all-the-breadsticks-you-can-eat policy — believing that hungrier customers would buy more entrees. It worked. Olive Garden stock skyrocketed by 47%. They were created as an intestinal disorder remedy that encouraged the appetite of the nine-year-old duke, Vittorio Amedeo II de Savoia, House of Savoy — eventually saving his life. A Florentine abbot originally described grissini as "long-shaped, bone thin" bread made in a town outside of Turin. People take their breadsticks seriously. On National Breadstick Day, we challenge you to find the restaurant in your area with the best breadsticks. Gather your crew and hit at least three restaurants. Order only breadsticks and decide on which restaurant to crown the National Breadstick Day winner. Do you have a presentation coming up at work? Imagine the look on your colleagues' faces when you step up to the podium, whip out your breadstick and commence to present. Let's just say that your presentation will never get lost in the noise. You will definitely make an impression. He's a Democrat and she's a Republican. Instead of a war of words, how about a duel — with breadsticks? Why not? After you've poked each other with your breadsticks, the original argument is forgotten and you get to sit down and eat your weapons. Hey, it can happen! 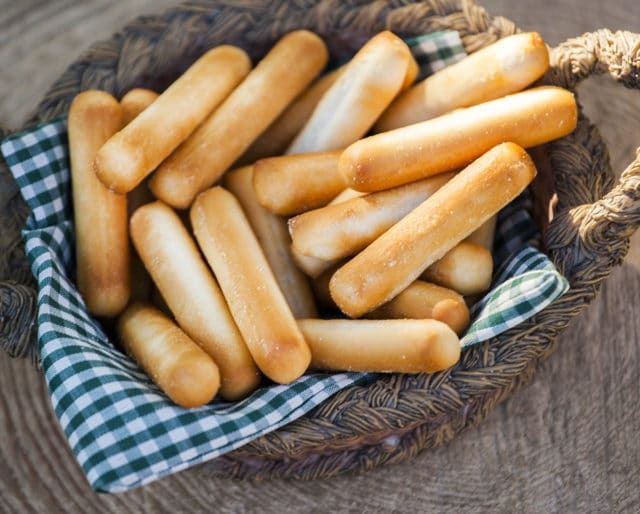 ​Although there are several versions of how breadsticks were created, the only thing everybody agrees on is that they are made of bread, enjoy an Italian heritage, and taste good. The main directive to 14th century bakers was to bake crispy breadsticks without burning them. What takes a breadstick from just good to great? Consider the joy of creating something magnificent from ordinary ingredients. Take ordinary bread dough rolled and sliced into strips. Set a moderate heat for your oven, and bake your delicious, homemade breadsticks for 20 to 25 minutes or until they are a shimmering, golden brown and serve them fresh. The question is...what CAN'T you do with breadsticks? Add conventional toppings like butter or cheese or be daring. Turn your breadsticks into dessert, slathered in cinnamon sugar and the decadent icing of your choice. Dip them in your favorite olive oil (genuine Italian, if you please) or scoop up a tantalizing dip of your own design. The only limits are in your own imagination. Even though most breadsticks are pointy, small kids can eat them without getting hurt. Breadsticks are wonderful snacks for children because they hold their shape well and won't dribble down their sleeves like drippy ice cream. Bread sticks are filling but will still leave the right amount of room for the afternoon or evening meal. It's bread — what's not to like about breadsticks?